(with N-terminal added cysteine) conjugated to KLH, corresponding to amino acids 884-901 of Human INCENP. Nuclear/whole extract of human HeLa cells. If slight turbidity occurs upon prolonged storage, clarify the solution by centrifugation before use. Working dilutions should be discarded if not used within 12 hours. There is some debate about whether this antibody is suitable for use in IF and we would be most interested to hear from researchers who test this antibody in this application. The antibody has been reported to be suitable for use in IF at a dilution of 1/100 using HeLa cells (see image below). However, one of our customers used this product in HeLa cells and reported an unusual staining pattern - please see the enquiries section of the online datasheet for further details. Our Abpromise guarantee covers the use of ab12183 in the following tested applications. WB 1/2000 - 1/5000. Detects a band of approximately 106 kDa (predicted molecular weight: 106 kDa). Immunocytochemistry/ Immunofluorescence - Anti-INCENP antibody (ab12183)This image was taken from an Abreview submitted on November 30, 2005 by William Moore. We do not have any further information relating to this image. HeLa cells were fixed for 10mins in fresh 3.7% paraformaldehyde, permeabilised with PBS + 0.1% Triton X 100, and blocked with 1% goat serum in Abdil. The primary antibody (in Abdil) was incubated OVERNIGHT (1 hour didn't work) at room temperature at a dilution of 1/150. The cells were co-stained with mouse anti-tubulin (secondary is Anti-Mouse Alexa 488) and ACA (Human anti centromere marker, secondary is Anti-Human Cy5) and DAPI. 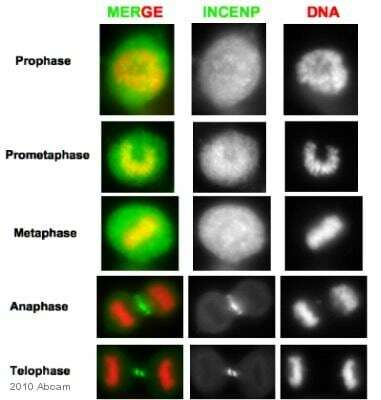 The figure shows projected images of dividing cells (prophase, prometaphase, metaphase, anaphase, telophase). The top panels show ab12183, DNA and microtubule stains. The lower panels are the same cells, showing a subset of optical sections at higher magnification. 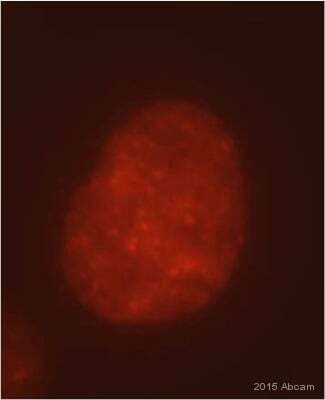 ACA (geen) stains centromeres and ab12183 (red) stains the inner centromere in prophase, prometaphase, and metaphase. The ab12183 channel has been linerally scaled to reduce the background staining associated with this antibody. Immunocytochemistry/ Immunofluorescence - Anti-INCENP antibody (ab12183)Image from BS Freedman et al, PLoS One 5: (2010), Fig 3. Demembranated sperm nuclei and CSF (cytostatic factor-arrested) low-speed egg extracts were prepared in XB and reacted at room temperature as described. Proteins were added to extract prior to sperm addition or else immediately after sperm addition into XB buffer (100 mM KCl, 1 mM MgCl2, 0.1 mM CaCl2, 10 mM K-HEPES pH 7.7, 50 mM sucrose) supplemented with energy mix (3.75 mM creatinine phosphate, 0.5 mM Na2-ATP, 0.5 mM MgCl2, 50 µM EGTA). To label damaged DNA, biotin-16-dUTP was added to metaphase reactions to a final concentration of 40 µM. 30 minutes after sperm addition, reactions were diluted 1/10 into XB supplemented with 1 mM MgCl2, 5 mM EGTA, 0.25% Triton X-100, and 10% formaldehyde and processed for Immunofluorescence. Antibody used ab12183 (red). Immunohistochemistry (Frozen sections) - Anti-INCENP antibody (ab12183)This image is courtesy of an Abreview submitted by Dr Kirk McManus, Univ. of Manitoba/Cancer Care MICB. Immunohistochemistry (Frozen sections) analysis of mouse embryonic skin - keratinocytes tissue sections labeling INCENP with ab12183. Tissue was fixed with paraformaldehyde, permeabilized with 10% Triton-X (0.05% Final) and blocked with Gelatin for 1 hour at 20°C. Samples were incubated with primary antibody (1/200) for 12 hours at 4°C. 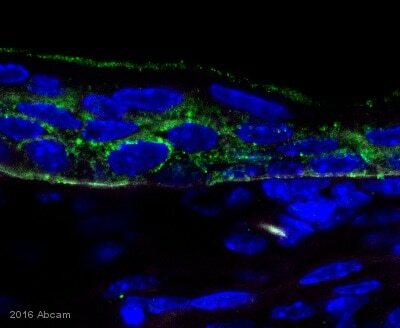 An undiluted Alexa Fluor 488 donkey anti-rabbit IgG polyclonal was used as the secondary antibody. Publishing research using ab12183? Please let us know so that we can cite the reference in this datasheet.